Several weeks ago, I threw down a kitchen gauntlet when I posted that recipe for Eggs In Hiding. I expected that it might make people run screaming from the room, and most did, but two stepped up and made it. De both made the original, and invented a modern variation, and decided the original was better. Kristin too made a modern variation, which her husband declared was good enough to eat again. I promised them each a kitchen implement - De's package is in the mail, Kristin's will be if she send me her address (hint). And Holly? I'm still waiting. I know you bought the corn flakes. She made it, and her kids ate it all up. Some time ago, Kelly gave me a prize. 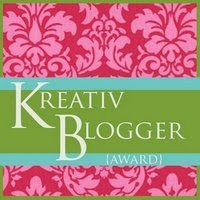 Since prizes like to be passed along, and seeing as both De and Kristin created new versions of the Eggs in Hiding recipe, I hereby bestow the Kreativ Blogger award on them. I'm really egg-cited! Thank you. Like my recipe, Kristin's looks involved. When it comes to hard-boiled eggs, I usually peel one as soon as it is cool enough to handle and scarf it down warm. That's the best. That's so cool that you had several takers on your challenge. I'd read De's post already, and now checked out Kristin's version. I'll be waiting for Holly's, too! And a very creative handoff of an award! I'm gitting scared with all this egg and fruit on the counter talk over here. My stomach's all gerbubbles tonight. Yay for De and Kristin. Hey, you too. Now that Jazz Fest is over we can focus back on eating things other than alligator and cochon du lait! I actually hard-boiled eggs yesterday to get ready...! I'm with DE. That's what I do.